I was hoping if I could get any information on a procedure for referencing Parameterized SoundCue nodes (like Continuous Modulator, Crossfade by Param, etc.) via BluePrints. I'd like to use arbitrary float values in BPs to automate SoundCue nodes. There are a number of SoundCue nodes that have as a property a Parameter Name, this name corresponds to the entries in the InstanceParameters property of an AudioComponent. For placed ambient sound actors (and other actors that expose the properties of the AudioComponent) you can add values to the InstanceParameters. In Blueprints, anywhere you have a reference to an AudioComponent (either via a component variable or the return value of PlaySoundAttached (PlaySoundAtLocation doesn't currently return a reference to an AudioComponent which is something we're reevaluating)) you can call the Set Float/Wave/Bool/Int Parameter to change the value of the parameter that the SoundNode is using. Hey Marc, I really appreciate the help! Thanks to your advice I was able to create a dynamic SoundCue with some basic real-time pitch control using the interpolation function. I've attached pictures--if this seems like decent form, I'll make a short video tutorial on the process. Great Dan, glad it worked for you. That setup looks exactly right. Only thing I might consider doing in some cases, depending on the needs would be caching off the output of the Play Sound Attached in to a variable, but that really is just for flexibility if your graph needs to be spread out. Yes, a video would be great! very interested in seeing how i can incorporate this into my own work. more BP audio stuff please! 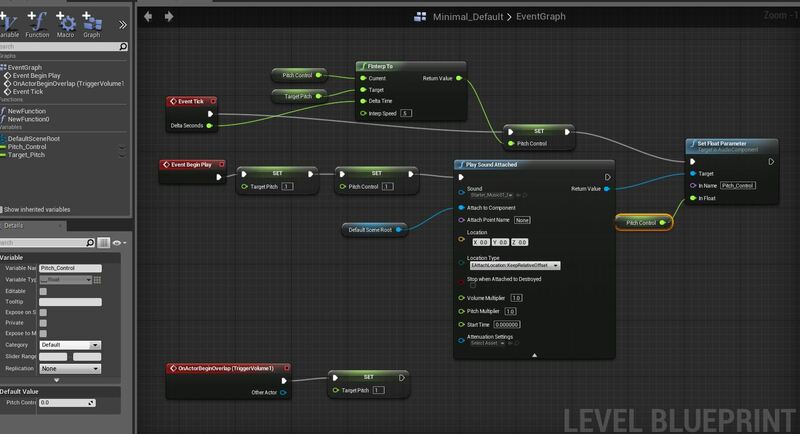 How to set initial color GPU particle parameter from blueprint? How to create a variable from Integer ? Why me save game variable aren't in scope when I load it? Why do these 2 widgets display the same variable on different actors?